Contest Winners! Meet the Pirates! Announcing our Cartoon Music Video Contest Winners! 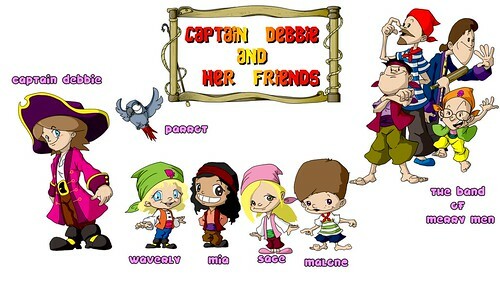 Waverly, Mia, Sage, and Malone will be friendly Pirate Mates featured in the new Debbie and Friends cartoon music video COMING SOON! Take the Wendell Cartoon Challenge! I’m so happy to introduce you to our new cartoon music video, “Wendell”! You may recall the song from our second CD, More Story Songs and Sing Alongs. In the cartoon version, Wendell is a boy who shows us that when you use your imagination, you can overcome obstacles and make your dreams come true! 1. When does “the spider” appear that is in every Debbie and Friends cartoon? 2. What is the “Debbie” character supposed to be in this cartoon? If you have the answers, email them to Debbie [@] debbieandfriends.net along with your email address and your child’s first name. 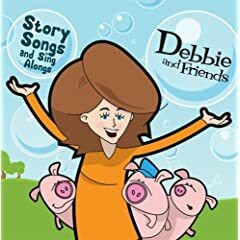 I’ll send a personalized congratulations email with a Debbie and Friends coloring page and Fan Club PDF to you for your child. Challenge ends July 9. Congratulations emails will be sent on July 10. Good luck with the Wendell Challenge! The event is a fundraiser for Temple Beth Elohim Nursery School in Needham, and the concert will take place at the Creative Movement and Arts Center, 145 Rosemary Street, Needham, MA. To enter the drawing, please send me an email before 9am EST on Friday, March 4, to Debbie@debbieandfriends.net, indicating you would like to attend the concert. I’ll print the names, put them into a bowl, and randomly draw the winning family and will post the winner here by 5pm on Friday. I hope to see you and your family on Sunday! I’m so excited to tell you that we’ve been nominated for the Nickelodeon Parents’ Pick Award! We’re in the top 5, and WE NEED YOUR VOTES to win! Please click the link below to vote. You can vote once a day through Aug. 30! Nominated for best kids’ music cd. Vote now! You are the reason we’ve been nominated. Thank you so much for your support of Debbie and Friends! Please vote! All Debbie & Friends cartoons include a very quick ‚Äúspider cameo.‚Äù It happens so fast that it‚Äôs easy to miss! To enter the contest, watch our music videos in the player below and try to find the spider in each one! Parents: simply jot down the approximate time the spider appears in each video, and send me an email with the answers for all six: Debbie [@] debbieandfriends.net on or before June 14, 2010. The band and I will throw the names of all the entering families into a hat on June 15, and draw the name of the lucky winner who will receive a Debbie & Friends Prize Package that includes a D&F T-shirt, two CDs, an egg shaker, and a personalized note. To view the movies in fullscreen mode, click “Fullscreen” at the bottom of the player. Have fun and good luck finding those spiders! D&F Remix Contest, Winner Announced! Thanks for all of your interest in the Debbie and Friends GarageBand Remix Contest. It‚Äôs been great fun! The winner is Boogie Cindy from the Boogie Wonder Band, and 12-year old Ala?Øa Lamontagne. Congratulations to Cindy and Ala?Øa for producing a very creative rendition of ‚ÄúWilly Won‚Äôt‚Äù complete with a percussion break, vocal effects, a kids shout-out chorus, and much more. Thanks again to everyone who participated, and congratulations to Boogie Cindy and the Boogie Wonder Band from Quebec, Canada. Your prizes are on the way! Calling all Kids (and their Parents): Create a Debbie and Friends Remix in GarageBand and enter your remix to win some great prizes! Here’s a chance to try your hand as a record producer. Between now and April 4, families can play around with the tracks of “Willy Won’t,” a new song from our forthcoming CD, More Story Songs & Sing Alongs, to create their own version. It is easy to enter the contest at http://debbieandfriendsremix.ning.com/. Contestants must submit their remix entries by Sunday, April 4th, as instructed on the contest site. All entries will be considered, and the winner will be announced on Monday, April 5th. The winners will receive great prizes from Debbie and Friends including CDs, music instructional books, t-shirts and other great gear. The winning remix will also be featured on this blog. Let’s hear what yours will sound like! Good luck!